American Conservatory Theater (A.C.T.) opened its new performance space, The Costume Shop recently. 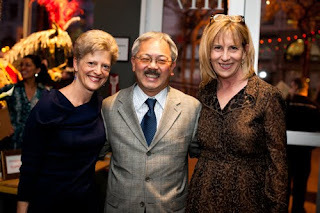 San Francisco’s Mayor Ed Lee, who helped usher in the momentous occasion, was surrounded by A.C.T.’s family of artists and supporters as well as representatives from the numerous arts organizations around the Bay Area. and A.C.T. Executive Director Ellen Richard. Photo by Orange Photography. The new space at 1117 Market Street (at 7th Street) is in the heart of San Francisco’s Mid-Market neighborhood in the space below A.C.T. 's longtime costume shop. Announcing the first-ever A.C.T. Conservatory Awards Luncheon on January 24! Celebrated alumni Annette Bening and Elizabeth Banks are among this year’s recipients. Join us for this star-studded event honoring A.C.T. alumni and donors who provide scholarship support. Go online at Conservatory Awards Luncheon for details and ticket information.